Took a test drive a couple weeks ago and I was sold. 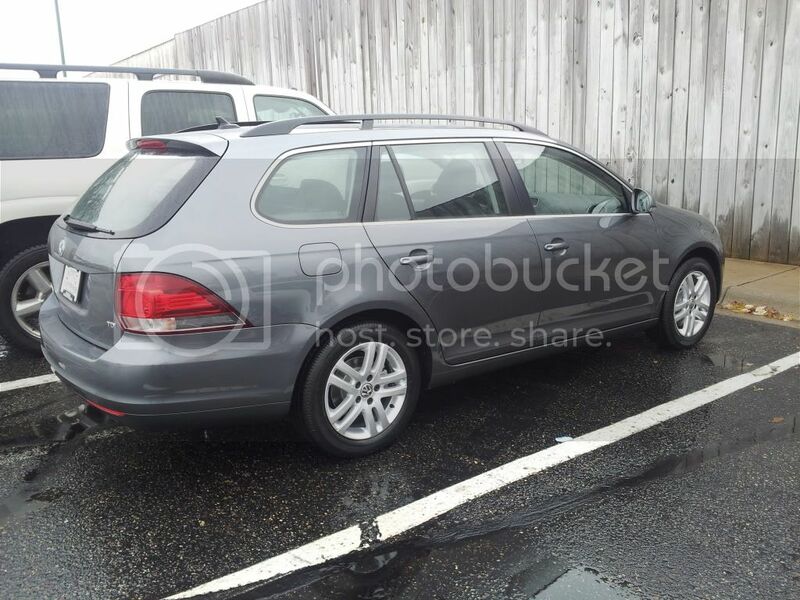 2013 Jetta...er Golf Sportwagen TDI, 6MT, Platinum Gray, Black Interior, Monster Mats, Heavy Duty Trunk Liner with CarGo Blocks, First Aid Kit, that's it. TDI's already come fairly loaded with BT, touchscreen radio, etc. The three options I really had were DSG, Sunroof and Navigation. DSG doesn't interest me. Sunroofs are nice but I rarely use them and Nav would have been cool but you have to get the Sunroof in order to get the Nav. Might order just the Nav unit later on from parts dept. Plans are to DD this thing until the wheels fall off. Maybe do a few minor mods along the way (famous last words). Malone Tune, DFP delete. done. How does a tune and DPF delete affect warranty? Is VW doing like BMW and looking for evidence of aftermarket tunes when cars come in? I have yet to hear of anyone having warranty issues with the DPF delete - most likely because they stopped going to the dealer long before they deleted the DPF. What is the DPF delete? New downpipe to remove the Diesel Particulate Filter. Its removal of a federally mandated emissions device. Not legal. Off-Road use only. Clear bra going on this afternoon. I've been scoping these as a possible next car. There are good deals on 2012 leftovers right now. Are those 16s? I thought all of these came with 17" wheels? New downpipe Off-Road use only. Most of us who own TDI's, have them for off road use only! If you get the sunroof or sunroof & nav package, you also get the 17" Portos. Since I didn't get those options, mine came with the standard 16's. Not a big deal since I usually change out wheels anyhow. Besides, 16's will be great for winter tires! Yeah, just looked at the vw site. I was thinking about golf tdis which all come with portos, it looks like. You are right, the 16's will be boss for winter tires. These cars look great with slightly larger wheels and a minor drop.